Offering reduced assembly costs and increased reliability, Nexperia has developed a four-pin X2SON4 package. It is claimed to be the smallest logic package that can be used without requiring an expensive and fragile step-down mask. As a result, PCB assembly is quicker, easier, more reliable and more cost-effective, says Nexperia. The company developed the X2SON packages – part of its MicroPak package range – to provide the smallest footprint for logic functions while ensuring pad pitch remains 0.4mm or over (step-down masks are only needed under that threshold). The company’s low-power AUP, AXP, LV and LVC technology families covering over one hundred logic solutions are now available in X2SON eight-, six-, five- and four-pin packages. The four-pin X2SON4 package option reduces the footprint of the same function by 44 per cent when compared to five-pin X2SON5, and by up to 64 per cent when compared to XSON packages, confirms Nexperia. The X2SON4 enables the release of smaller buffers and inverters, that were previously only available in five- or six-pin leadless packages and without the use of expensive and fragile step-down masks. As packages become smaller, the pad pitch is reduced – making the use of standard assembly tools difficult. If the pitch is reduced to less than 0.4mm, thinner and delicate step down masks (stencils) are required to apply solder paste. They typically need to be replaced regularly, may also require a different, more expensive solder paste, and the placement of components may be restricted because the mask will not work over the entire board. X2SON packages from Nexperia save manufacturing costs as they require no step-down mask. Additionally, the X2SON’s larger pad pitch provides a greater contact area, resulting in easier component placement, as well as improved joint strength and robustness, says Nexperia. Larger pad pitches make it easier to avoid costly assembly problems such as misaligned components, and reduce the risk of short circuits. The X2SON4 logic package is future-proof, says Nexperia, and also features a low 0.32mm profile and low 0.6mm width and length, for use in space-constrained, portable applications such as IoT, wearables and consumer electronics. The devices are RoHS and dark-green compliant with NiPdAu leadframe finish. 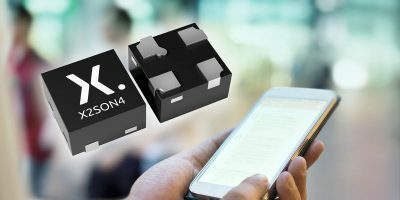 There are a total of 10 AUP and LVC logic buffers/inverters currently available in the new X2SON4 (SOT1269-2) package.